I love RSS Feeds, and even moreso, I love the book sales RSS feed. It gives me an easy way to know when I last sold a book on Amazon, what domain it was on, and how many copies were sold. However some people don’t know what an RSS feed is nor the benefits of them, so I decided to add a quick tip on how to get the RSS feed into your iGoogle homepage. This allows you to start your computer and browser and be immediately met with the recent sales information. You can even click through the links in the book sales results and see your page on NovelRank. Here are the easy steps. Go to http://www.google.com/ig. You will then create a homepage or click the sign in link in the bottom left if you have a google account (I have a gmail account). All of these widgets can be dragged and moved around the page so you can get the most important stuff up top. You can also remove any you don’t want to keep it from being too cluttered. There’s lots to explore here, so let’s just jump right into the next step. Go to your book’s page on NovelRank. 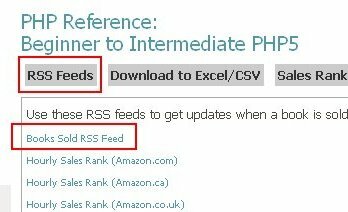 Click on the RSS Feeds box near the top to expand out the list of available RSS feeds. You can right-click on the Books Sold RSS Feed and choose “Copy Link Location” (Firefox), “Copy Link” (Safari), or “Copy Shortcut” (Internet Explorer) to copy the link to your clipboard. We’ll be using it in just a moment. 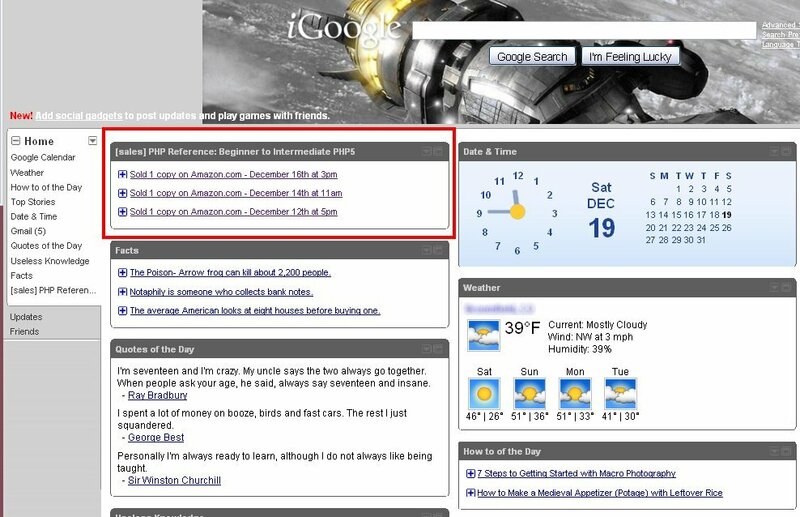 In the top-right of the iGoogle homepage, click the Add Stuff link. The next page has a ton of widgets, but you are interested in the Add feed or gadget link near the bottom of the left column. Click the link and it will expand to a box where you can now Paste in the link that you copied earlier. Click the Add button and the small window will update to tell you it was successfully added. 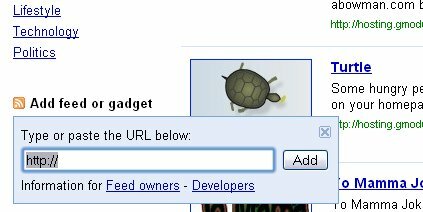 Click the « Back to iGoogle home link in the top-right. You will now see the new widget/box in the top-left with the contents of the RSS feed. Be advised that this box may be empty if there have been no sales yet tracked by NovelRank. That’s it! Keep selling your books! 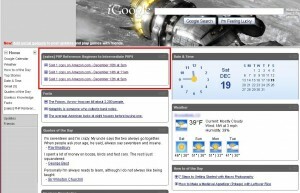 This entry was posted in Tips and Tricks and tagged igoogle, rss on December 21, 2009 by Mario Lurig. I’ve been plugging your site all over the CreateSpace member forums. This is really great information! Thanks for the kind words! I have no idea, as some books like mine aren’t available in brick & mortar stores. Only publishers know that info. I wish there was some info released about that; it would be interesting to see what revenue one may be getting if their book was in stores. Do you have any idea how many books sell on Amazon as opposed to other venues? For example, on average, say a book is selling 5 copies a day through amazon. I wonder if there is any information anywhere as to what percentage of total sales that is? Perhaps 4 books were also sold in brick and mortar establishments that day as well?